What do you learn on The Bronfman Fellowship? The Bronfman Fellowship is a space of learning for learning’s sake. An intellectual program without tests, homework, grades, or judgment, where Fellows can give free rein to their curiosity and explore issues with depth and candor. Throughout the Fellowship, Fellows achieve a deeper understanding of themselves and one another through exploring Jewish ideas and texts. They meet with great thinkers who are asking big questions, visit sites around Israel, and study texts that range from traditional materials to contemporary Israeli and American voices. These are texts that ask, and work to answer, stimulating existential questions. The Bronfman Fellowship is at the forefront of Jewish education. 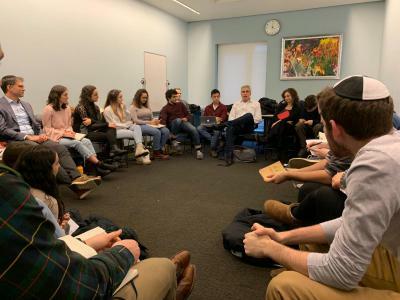 Our diverse faculty of Rabbis and educators create an atmosphere of intellectual openness, in which deep thinkers and questioners feel at home as well as challenged. Our unique learning atmosphere is marked by depth, rigor, personal relevance, and learning for the sake of learning. Fellows are able to pursue interests, passions, and modes of thinking that they may not be able to explore during the school year. The Fellowship is not a for-credit program, nor are Fellows given any homework or assignments outside of their daytime seminars. Click here to see a day in the life a Bronfman Fellow. The Fellowship's faculty, speakers, and seminars change from year to year. Below are some examples of seminars, taught by resident faculty members, and speakers. Jonathan Haidt - American social psychologist and author of The Happiness Hypothesis and The Coddling of the American Mind. Dara Horn (Bronfman ‘94) - Award-winning American author of The World to Come, A Guide for the Perplexed and Eternal Life. Rabba Tamar Elad-Appelbaum – Named one of The Forward’s Top 5 Female Religious leaders in Israel for her work promoting pluralism and Jewish social engagement. Anat Hoffman – Founding member of Women of the Wall and Executive Director of the Israel Religious Action Center. Etgar Keret - Contemporary Israeli author of short stories and novels including The Bus Driver Who Wanted to Be God. A.B. Yehoshua – Israeli novelist, essayist, and playwright. Shiurim (seminars) and speakers from the last two years of the Fellowship. THE BRONFMAN FELLOWSHIP is a registered trademark of The Bronfman Youth Fellowship in Israel, Inc.